The following was edited from Brie Loskota’s opening remarks at Reimagining Religion: A Conversation about the Future of Religion, held at University of Southern California on February 9, 2017. We are in a period of flux, a period of rapid and continuous change, where the old order is being torn down, where people are disaffiliating from groups, and where institutional life is being stressed and stretched. This is acutely true in the realm of religion, where contestations to religious power, authority, truth and organizations can be seen in across every tradition and denomination. Is it only a period of destruction or is there more going on? Does religion offer us a unique window to understand how this larger period of flux is playing out? 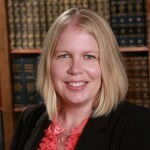 CRCC’s project on Religious Competition and Creative Innovation sought to uncover the leading edge of how groups are responding to this period of flux. How are they changing? What new forms of organization are being developed? What is being carried forward from their past and what is being reimagined in light of the contemporary period? We mapped 555 congregations in six different areas of Southern California, developed in-depth case studies of 76 congregations and organizations, and conducted more than 300 interviews with leaders and members. 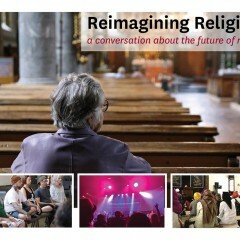 In doing so, we’ve found “reimagined communities”—religious and irreligious groups that are particularly creative in their response to this period of flux—that are shaping the future of religion in Los Angeles and beyond. As the most religiously diverse experiment in all of human history, Los Angeles has seen a boom in religious and irreligious innovation. By innovation, we don’t mean creating something entirely new or a new form of revelation. Entirely new religious movements do arise, but they are rare, as is the idea of a new revelation or book of scripture. Instead, we take innovation to mean the reassembling of different things to meet contemporary challenges. We see innovation as the repurposing, rediscovering, recombining of what already exists, sometimes bringing those things from one group into another, and infusing those things with new meaning and relevance. It means being open to trying out something other than what has always been done, even if it means pushing the boundaries of the current acceptable orthodoxy. We see innovation as a form of creative problem solving. Young adults who are leaving established institutions are forming new kinds of associations to nurture a sense of purpose and belonging. Congregations with empty pews are experimenting with novel forms of music and liturgy to try to attract converts as well as to retain the faithful. Service-oriented groups that welcome all, regardless of religious affiliation, are spreading across the country. And a variety of spiritual practices that focus on the experience of individual believers are flourishing here in Los Angeles. 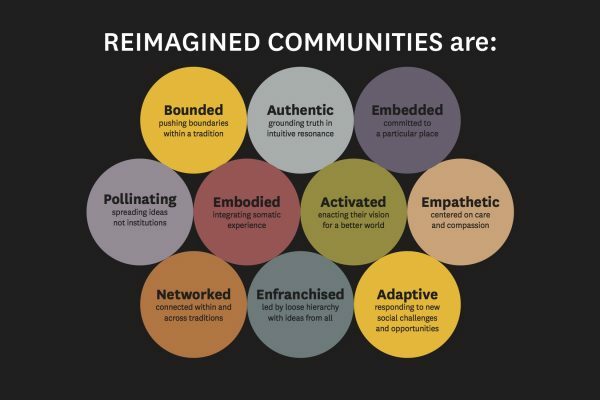 In analyzing the commonalities of the “reimagined communities” that we’ve found, we have identified 10 characteristics that capture how groups are innovating and responding to this period of flux. These characteristics span across religious traditions—and the lack thereof. Some groups might focus on some qualities more than others, but we were able to pinpoint these characteristics in each group. Bounded: While they are innovating and pushing boundaries, they are constrained by forms of religious traditions or ways of operating. Authentic: Communities ground truth not in abstract concepts but in ideas with internal and intuitive resonance. Embedded: These groups are committed to a particular place and want to make a difference there. Where these groups are located is highly significant. Pollinating: These communities are interested in spreading ideas rather than establishing institutions. They are not interested in institutional life itself. In fact, many of them are very organic: they live, they grow and they decease. Embodied: The groups are interested in the somatic or bodily experience because of the belief that knowledge and value is gained from the somatic. Activated: These communities are not just congregations with ideas. They enact their vision for a better world and make things happen. Empathetic: Actions to enact change are grounded in empathy, care and compassion, often for marginalized people. Networked: These communities are strongly connected within and across traditions. Enfranchised: These groups do not have a strict hierarchy. Instead, they welcome ideas from all sides. Adaptive: These communities respond to a new social challenges and opportunities with sense of possibility, rather than a sense of fear. Our definition of Reimaged Communities can be a lens through which to examine other communities, not simply those in our L.A. study. Communities that map onto this taxonomy are the ones we are watching to uncover how religions may navigate, survive and perhaps even thrive while facing the challenge of this current environment. As new leaders, theologies, practices and organizations emerge or find a foothold in a particular group, we can begin to chart the course of what may find a larger audience in a few years time. And that audience may expand beyond Los Angeles through social media, networks and conversations between groups in L.A. and groups on the other side of the world. Religion in Los Angeles serves as a window into what else is happening around the globe, a way to see the changes taking place in culture, work, politics and other ways that people organize their lives. You can hear about how these phenomena play out by listening to the sessions from CRCC’s Reimagining Religion conference. Click here to watch the conference. You can also see how our case studies reflect these 10 characteristics by exploring blog posts, maps, videos and more from this project.